﻿P﻿hotograPhylia® is a service mark registered in 2015 by José L. Diniz, a trainer, photographer and former editor-in-chief of the Portuguese edition of Super Foto Digital magazine. 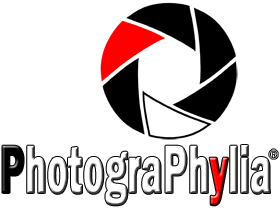 It is our goal to become a reference mark for all those who look at Photography as their way of personal expression and feel the need to develop their own skills in capturing, editing, post-process or print photographs. For them we offer training events where technical, aesthetic and even leisure components are present. We rely on the technical skills and extensive experience of our trainers in encouraging the personal quest and developing the taste for Photography, its universal nature and the spirit of doing better and better. Referring to the philosophy behind the creation of the service mark, the graphics associate the mark's name to one of the most iconic symbols in Photography: the diaphragm blades. These are open to a moderate value, aiming to get the highest image quality provided by the lens. The hexagonal shape of its opening - evocative of perfection, universality and integration - was used in the past in evaluative metering mode of some high-end cameras. In mathematics, the '6' is the first of the so-called 'perfect numbers' series. The white and black tones stand for the elementary photographic processes as their own limit values​​; the red color symbolizes the intense passion felt by all those who live and breathe Photography.